Cactus Gallery is pleased to invite you to visit and check out our new ART BIN. Our PAREJA CALAVERA (Skeleton Couple) is the newest addition to the Cactus Gallery. The skeleton couple was created by Mary Clark-Camargo of New Stone Age Mosaic Studio, who shares a space with Cactus Gallery. Read below to see how it all came about. 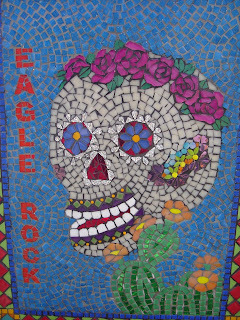 Almost one year ago, the Eagle Rock Association Beautification Committee (TERA BC), in conjunction with the Arroyo Arts Collective (AAC), and the Center for the Arts, Eagle Rock, invited artists to create ceramic mosaic panels designed to adorn trash receptacles to be placed throughout the Eagle Rock area. 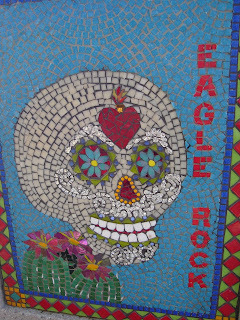 The artist were selected and the mosaic panels are now being attached to 20 cast concrete trash receptacles gracing Eagle Rock's main commercial streets. The Eagle Rock Make Art Not Trash program unites the rich cultural heritage of the community with the creativity of 17 artists and 21 of Eagle Rock's civic minded businesses and organizations that maintain the trash receptacles. This project uniquely identifies the Eagle Rock community while providing a positive and practical solution to local litter. Participating artists: Mary Clark-Camargo, Marcela Ciszewski, Valerie Daval, Marikit de Lara, Frances Garretson, Rebeca Guerrero, Linda Johnstone-Allen, Mary Jean Mallman, Luz Mack-Durini, Megan McHone, Dawn Mendelson, CJ Metzger, Suzanne Siegel & Helaine Melvin, Toros Tngrian, Kacy Treadway, and Kelly Witmer, as they showcase their work. Funding for the Eagle Rock Make Art Not Trash Program was made possible through The Eagle Rock Association (TERA), The Community Beautification Matching Grant of the City of Los Angeles Department of Public Works, Eagle Rock Community Preservation and Revitalization (ERCPR), Eagle Rock Chamber of Commerce (ERCC), Eagle Rock Neighborhood Council (ERNC), and the Eagle Rock Kiwanis Club. Selected tiles graciously donated by Dal-Tile. Graphic Design donated by Corky Retson. 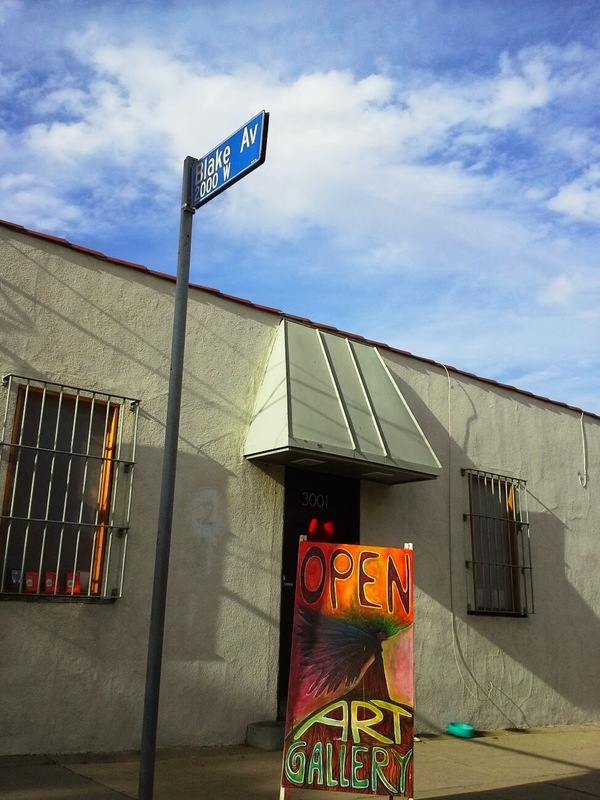 AFTERWARDS you can GALLERY HOP your way through Northeast Los Angeles during (NELA) SECOND SATURDAY GALLERY NIGHT. NELAart Second Saturday Gallery Night is a free self-guided tour of the galleries, non-profits and artist run project spaces located in Northeast Los Angeles (NELA). NELA has a tradition in the arts that dates back to the early 1900’s when the USC College of Fine Arts was located in Highland Park and characters like Charles Lummis and Antonio Corsi were living in the area. The tradition continues with new spaces opening regularly. NELA is now one of L.A.’s most exciting destinations to view contemporary art. The Eagle Rock Block Party is a monthly event comprised of local and independent retail businesses located in Eagle Rock, California. Each Second Saturday of every month, merchants will be participating day and night attracting devoted and new customers with special promotions, live events, music, special discounts, classes and demonstration for both kids and adults. The evening hours will coincide with the monthly NELA Gallery Night which provides maps to local galleries and their current openings on that evening. The ERBP illuminated cube will hang in front of every participating merchant as a visual marker for traffic and visitors. Each business is free to creatively energize the day in their own way. Dance performances, craft instruction, stand-up comedy and many other opportunities for celebration enliven the event. The ERBP is a special event that people will want to come back to again and again because it will constantly evolve, change and grow. The ERBP is about creating local stimulus and reinforcing community spirit so that small town walking areas remain a part of the Los Angeles experience. Please check out my friend Dan's project. Earthman Dan, his furry green space buddy, Ecos, and Solar Cindy bring environmental awareness and responsibility to our youngest generation. They will be performing this Sunday, May 10th at 12pm, 2pm, and 3pm in the North American Mammal Hall (Level 1) at the Natural History Museum in L.A.